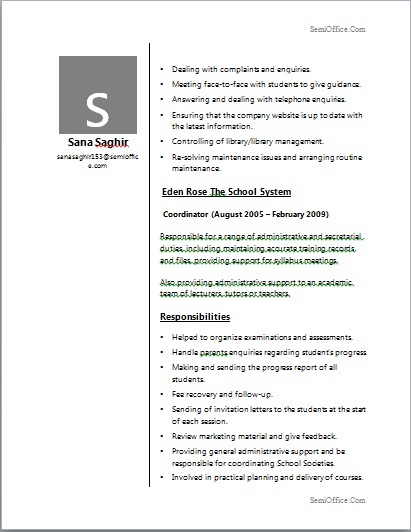 Resume For Teacher Position Template and example including Teaching Objective, Academic, Achievements, Memberships, Computer Skills, Research Projects and Personal Information. To become a part of leading and growing institute that gives an opportunity to learn and improve my professional skills, seeking for challenged job which can improve my talent having professional approach. Govt. Fatima Jinnah College for Women, Gujrat. R.K.M. Model High School, Gujrat. “Depression, Anxiety and Stress in the Caregivers of Special Children” under the supervision “Mr. Tariq” Lecturer and Researcher, Department of Psychology and Applied Psychology, University of the Punjab, Lahore. A Model titled “Self-Esteem and Achievements” presented in National Conference on “New Trends in Psychological Research” held in Department of Psychology and Applied Psychology, University of the Punjab, Lahore, April 20XX. • Merit Scholarship from University of the Punjab Lahore. • Certificate for model making. • Six months Internship in “Tahir Heart Institute” as a Clinical Health Psychologist and Researcher. • Computer Searching, Photography, Painting, Gardening, Music, Writing, Reading. 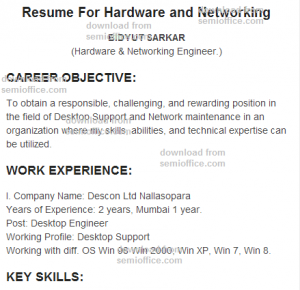 Sample resume format for hardware and networking engineer fresher with computer course. CV for diploma in computer hardware and networking specialist. To obtain a responsible, challenging, and rewarding position in the field of Desktop Support and Network maintenance in an organization where my skills, abilities, and technical expertise can be utilized. Years of Experience: 2 years, Mumbai 1 year. Working with diff. OS Win 98 Win 2000, Win XP, Win 7, Win 8. • Computers problem troubleshooting, Assembling, Dissembling. • Laptop, Desktop work done. • Data Recovery of Hard Disk. • Build, test and modify product prototypes, using working models or theoretical models constructed using computer simulation. • Printer Sharing & Troubleshooting of shared printer. • Can work on Remote Software. • Basic LAN & Wireless Networking. • Good knowledge of Desktop. • Worked on Win XP, Win 7. Working with MS Office’07, Tally 7.2. Typing speed up to 20-22 wpm. 12TH passed with 56.07% year 20XX from W.B. Board Kolkata. George Telegraph Training Institute Hardware & Networking Course from Kolkata. Two year Advance Diploma in Computer from Tricom Computers. I hereby declare that all the information made in this resume is true, complete and correct to the best of my knowledge and belief. In the event of any information being found false or incorrect, I shall be responsible for the same. 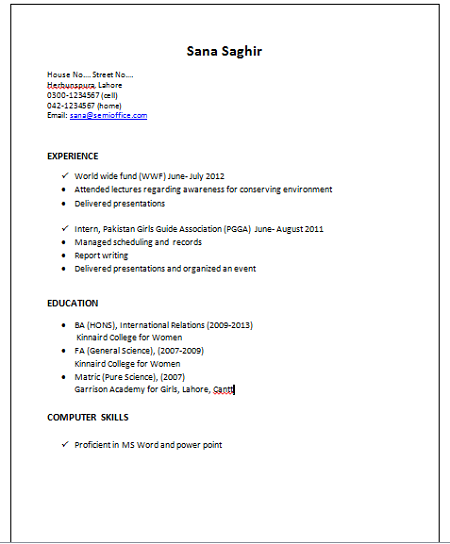 Sample of Resume of BA/BSc and MA/MSc in Economics Major and Politics from LUMS University Student Lahore. All the confidential information are changed. Including Resume Objective, Resume Qualification or Education, Professional Experiences, Research & Projects, Extra-curricular activities, HONORS & AWARDS. You can use this resume for job in school, internships, admissions in foreign universities or to applying in multinational companies. 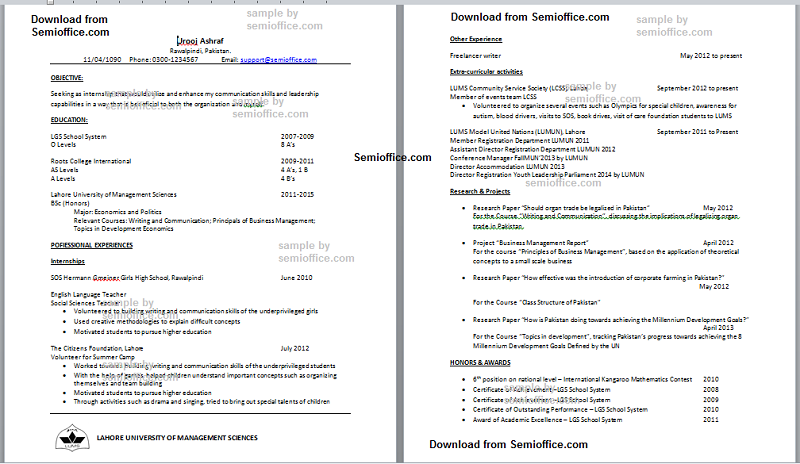 Free Download the Sample of Economics Resume by LUMS Students. Seeking as internship that would utilize and enhance my communication skills and leadership capabilities in a way that is beneficial to both the organization and myself. For the Course “Writing and Communication”, discussing the implications of legalizing organ trade in Pakistan. 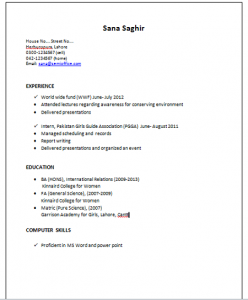 Resume Sample for International Relations for BA students of IR without any professional experience. 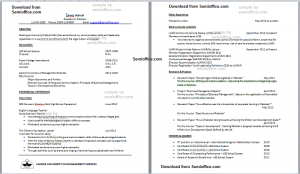 Sample CV for international relations available for free download in Ms Word Format. 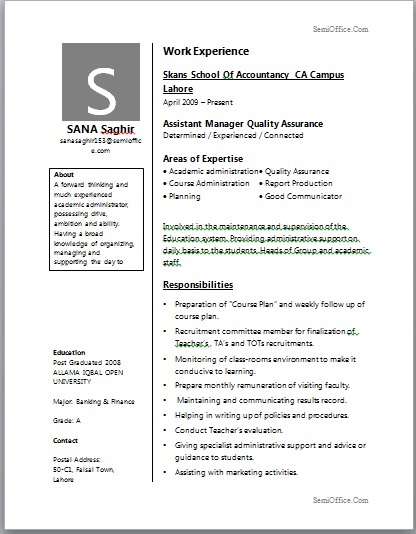 Resume For Assistant Manager Operations Experienced Professional in Banking & Finance with job experience as Assistant Manager Quality Assurance, Coordinator in School and Experience in Administration and Management in MS word and PDF for free download. A forward thinking and much experienced academic administrator, possessing drive, ambition and ability. Having a broad knowledge of organizing, managing and supporting the day to day activities required for running an educational institution. Involved in the maintenance and supervision of the Education system. Providing administrative support on daily basis to the students, Heads of Group and academic staff. Preparation of “Course Plan” and weekly follow up of course plan. Recruitment committee member for finalization of Teacher’s , TA’s and TOTs recruitments. Monitoring of class-rooms environment to make it conducive to learning. Prepare monthly remuneration of visiting faculty. Maintaining and communicating results record. Helping in writing up of policies and procedures. Giving specialist administrative support and advice or guidance to students. Meeting face-to-face with students to give guidance. Answering and dealing with telephone inquiries. Ensuring that the company website is up to date with the latest information. Re-solving maintenance issues and arranging routine maintenance. Responsible for a range of administrative and secretarial duties, including maintaining accurate training records and files, providing support for syllabus meetings. Also providing administrative support to an academic team of lecturers, tutors or teachers. Helped to organize examinations and assessments. Handle parents inquiries regarding student’s progress. Making and sending the progress report of all students. Sending of invitation letters to the students at the start of each session. Review marketing material and give feedback. Providing general administrative support and be responsible for coordinating School Societies. Involved in practical planning and delivery of courses. Maintaining an electronic and hard copy filing system. Ensuring that examination papers are drafted within the appropriate timescales. Recommending changes in office practices and procedures. Providing dedicated support to the range of activities like teaching methodologies, administration and discipline level in the organization. Experience of working in a busy environment. Flexible and able to adapt to the changing demands of a job. Worked in cooperation with other business departments. Effectively organizing and prioritizing work duties. Providing training and orientation for new staff. Scheduling meetings and preparing agenda. In depth knowledge of course evaluation and course approval procedures. Able to effectively co-operate with colleagues to ensure goals and targets are met. Helping to promote a strong sense of community among its diverse student and staff population. Maintaining good working relationships with subordinates. Having the ability to deal positively with changing circumstances. Coordinating and communicating activities for the Office, including all employee events. Assisting in the coordination of all recruitment activity. Implementing company policies and ensuring employee compliance. Overseeing the smooth and efficient running of all aspects of the office. Carrying out staff appraisals, managing performance. Managing all business inquiries via phone, email, and multimedia. Sample Job Application with experience for Transport In-charge, Manager Transport, Transport Administrator etc free download. I want to work with leading Organization like yours, to strive for challenging career opportunity in an organizational setup. Where I can improve and polish the system and sub-ordinates in much better ways. I have 7 years experience of office work as Cashier and 2 years transport In-charge. I have demonstrated all my abilities in my resume. I am interested to work with your organizations. Please give me a chance for any suitable job. I am writing to show up my keenness to work with well reputed firm like yours. Through some reliable sources I have come to know about the job opportunities in your organization and I wanted to avail that. I am an educated person, did my Graduation from Lahore University. I am an experienced person, I worked as Cashier for 2 years in ABC Company where I was responsible of cash handling, making bills and it uplifted me a lot. I also have experience of working as a Transport In-charge for three years; there I deal with transport vehicles provision and maintenance. I am doing my recent job with devotion, but seeking for better choices is my right. I want to work and provide my services to your esteemed organization where I can utilize my practical knowledge for the worth of organization. I am sure that you will definitely give me a chance to prove my sincerity. I shall be waiting for pleasing response from your side. In reply of your advertisement regarding the subject post of transport in-charge in your service, the applicant intends to apply for the same. The applicant has qualification of transport engineering from university of wales and has five years’ working experience in relevant field. The applicant has been working for Police department as Transport Maintenance Inspector (TMI) and responsible for smooth working of all operational vehicles in the department. My experience certificate can help you to judge my skills and devotion towards assigned tasks.